A title like Treasure Island should need no introduction. It’s the name of a famous novel and it’s also the main motif in a lot of pirate themed slot machines, just like this one. It comes from Microgaming, and it’s one of their many classic titles which have elaborate bonus games and better than average graphics. The choice of theme isn’t original, there are a lot of both modern and classic slots with this kind of design, but you’re going to find that this one is among the better looking ones in its category (3 reels). 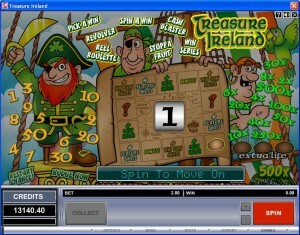 Treasure Island is a classic slot, with 3 reels and 1 win line on them. The game rewards you with payouts of up to $5,000, but it also offers plenty of cool bonus features which are concentrated into a single one. The bonus game of Treasure Island gives you a lot of different potential rewards, including various bonus games, cash prizes and nudges. In order to gain access to this bonus game, you need three scattered Map symbols, which have to be in view, even if they’re not on the only payline. 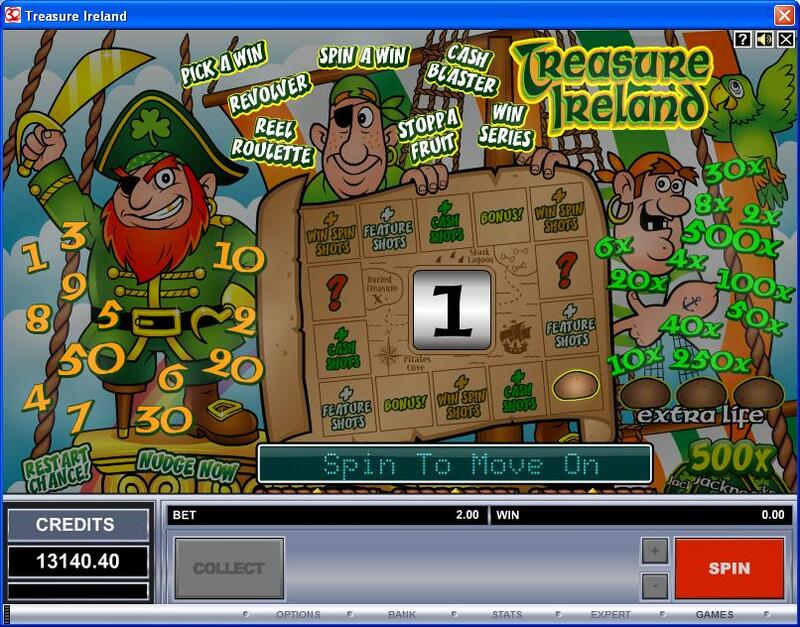 Once the bonus game has loaded, you will see a board game, on which you can move at random, ending up on a feature shot, on a bonus, on cash shots, win spins, extra lives or mystery prizes. Between 1 and 50 nudges can be obtained. The cash prizes vary between 2x and 500x. A maximum of three extra lives can be accumulated and you can also get additional spins on the bonus board. 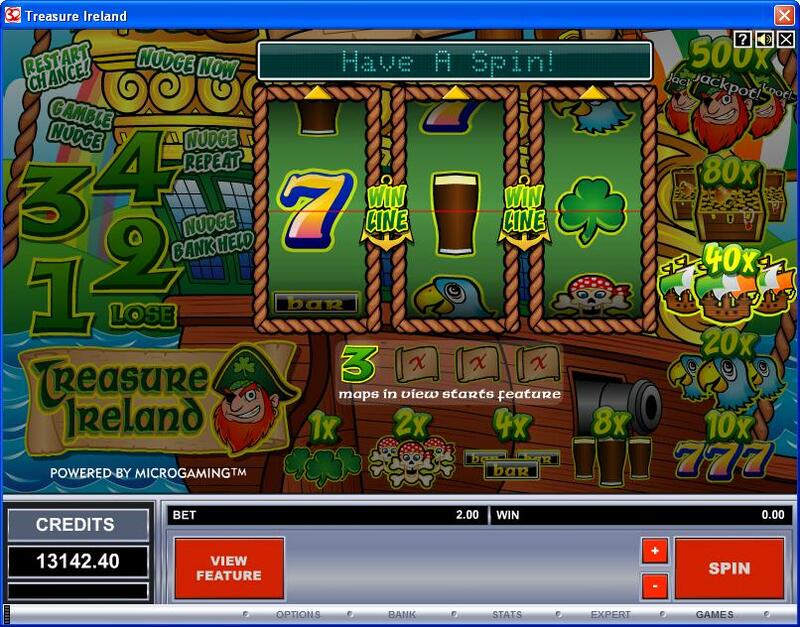 As for the bonus games, you will find on the board names like Win Series, Stoppa Fruit, Cash Blaster, Spin a Win, Reel Roulette, Revolver and Pick a Win. You don’t have to spend a lot of time figuring out the betting system. You only have one coin to use on it and you decide what the value should be, with the maximum value at $10, while the minimum is $0.10. The game offers payouts of up to 500x, so you know that you can get up to $5,000 if the coin value was the right one. The design of Treasure Island is miles ahead of many of its classic brethren, but it still doesn’t compare with a true pirate themed modern slot. What saves it is the amount of details included on the main game screen, with a decorated pirate ship in the background, with paytable and bonus game info around the reels. The reels are green and surrounded by rope, so they’re themed, and that’s something extremely rare for a 3 reel game. Symbols: Map (scatter), Pirate (500 coins), Treasure Chest (80 coins), Pirate Ship (40 coins), Parrot (20 coins), Yellow 7 (10 coins), Beer Glass (8 coins), Bar Icon (4 coins), Skull (2 coins) and Clover (1 coin). I’ve enjoyed a lot of things about this slot, the two main ones being the wealth of features obtained through the bonus game and the quality of the design. 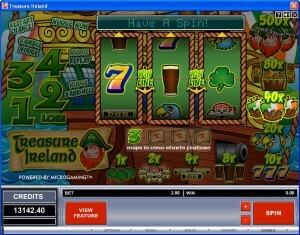 Treasure Island can be found at any Microgaming casino, where you get a chance to play it for real money or in free mode.